These are AWESOME!! I had the pleasure of having one with my morning coffee!!!! 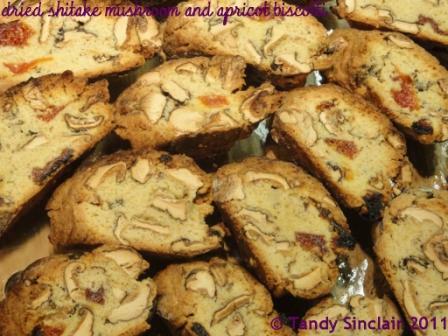 Just finished my biscotti!!! Even Rudi my son tried some – he does not like the idea that there are mushrooms in but they smelled so nice he had to try. I used a field mushroom I picked in the mountain yesterday and it weighed exactly 99.50 gm… think the recipe was made for it. Thanks for taking the trouble to share it with me – I am passing it on to a friend in Italy if this is ok with you. So, I hope you give them a try – and if you don’t want to try mushrooms do what I did for my second batch and use pistachios and dried sour cherries, or use your imagination and go wild! If I were to make them again I would substitute the vanilla essence for truffle oil and I would add half a teaspoon of finely ground star anise. Intersting combo, it’s the addition of sugar that gives it a twist! A bit of sweetness. I make a delicious stuffing for a pork roll made of apricots,mushrooms,prunes and pine nuts, so I know mushrooms and apricots go together, but use the sweetness of plump apricots. I’d serve these biscuits with a beautiful creamy cheese, I am a savoury girl though! Wonderful idea! Friday greets back and me too! Well done Tandy! I LOVE mushroom so will definitely give this a try. thanks Mandy – these were surprisingly good!